Smoking is a delicious way to prepare a whole turkey. All you need is the turkey, seasonings, time, and patience. You also need the right equipment. For me, that is an electric smoker, such as the Masterbuilt Digital Electric Smoker. My first attempt at smoking a whole turkey was an epic fail. I neglected to measure the height of my charcoal smoker from the grill surface to the underside of the dome lid before purchasing my giant turkey. The bird was too tall for the lid to close snuggly. I did channel my inner MacGyver and came up with a smaller grill rack that was perched on rocks inside the smoker so the top would close tightly. Unfortunately, the turkey was too close to the heat source and was cooking unevenly. Needless to say, I ended up finishing the main attraction in the oven after 3 hours of trying to adjust the smoker. Whatever type of smoker you use, buy a bird that will fit into it. I am a big fan of staying between 12 to 14 pounds. With a tall electric smoker box you could fit 2 smaller birds on upper and lower shelves, and maybe rotate them half way through the cooking. There are a few steps to take before the turkey is ready for the smoker. Follow these tips and you should get great results. 1. Size Matters. Buy a turkey that fits inside the smoker. 2. Thaw the turkey completely and slowly. If you purchase a frozen turkey, place it in a large pan in the refrigerator with the wrapping still on it. It will take approximately 2 to 3 days to completely thaw. Do not leave it out on the countertop to thaw more quickly. 3. Remove the neck and giblets. Yes, this is one of those “duh” moments. I know many a home cook who has served a turkey with the bag of giblets still in the cavity. Save them for making stock or gravy. 4. Should you brine? I have to be totally honest that I cannot tell much difference between a smoked turkey that has been brined or just really well seasoned. I have tried brining several times and am just not into all the effort that takes. Don’t buy a pre-brined or already seasoned bird. You never know how long it has been sitting in the brine. My experience is that you may end up with a salt bomb or a waterlogged fowl. If you do brine, use a 1/2 cup of salt and 1/2 cup sugar to every gallon of water and completely submerge the bird. A cooler with a plastic bag to line it works pretty well. Allow the turkey to sit in this for 12 to 14 hours. 5. Rinse and dry. Whether you brine or not, thoroughly rinse the bird under cool running water. With plenty of paper towels, pat the inside and outside of the turkey until it is completely dry. Now you can move on to the recipe for smoking a turkey in a Masterbuilt Electric Smoker. Recipe below is a herb rubbed smoked turkey recipe. We also have a different page if you’re looking for how to make a perfect, smoked Thanksgiving Turkey. Many home cooks love to season a turkey with Cajun spices before smoking. I am a little old school in that I like turkey to smell and taste like Thanksgiving. My recipe uses more traditional poultry seasonings that seem to appeal to all tastes. Feel free to change it up and use Cajun spices or just salt and pepper. 12 to 14 pound turkey, prepared as directed above. 1. Preheat the smoker to 225˚F. 2. In a small bowl, mix together all the dry herbs and spices. Rub the interior cavity of the turkey with 1/3 of the dry seasonings. 3. Add the EVOO and orange zest to the rest of the seasonings and rub all over the outside of the turkey. 4. Place the water and apple cider in the water pan in the bottom of the smoker, filling it only half way. Place a drip pan on the next shelf above the water pan to collect drippings from the turkey. Fill the side drawer with the wood chips. 5. Tuck the wing tips tightly beneath the turkey. Place the seasoned turkey on the middle rack of the smoker, close the door, and set a timer for approximately 6.5 hours. The turkey should smoke for 30 to 40 minutes per pound, until the inside temperature reaches 165˚F. 6. Check every hour for smoke. Add wood chips if you don’t see any smoke. Start checking the internal temperature of the bird after 3 hours and every 45 minutes with an accurate meat thermometer. Alternatively, use the digital probe thermometer that came with your smoker. 7. Remove the cooked turkey to a cutting board and allow it to rest for a minimum of 20 minutes to 2 hours before carving. If you are looking for a convenient side dish to go with your turkey, try smoking some whole sweet potatoes. You can do these on the top rack above the turkey during the last 2 to 3 hours of smoking. Do not place them below the turkey that is not fully cooked. 1. Wash the potatoes very well, removing the eyes. No need to peel them. Poke a couple of holes in them with a fork. Brush them with olive oil and sprinkle with sea salt. 2. After 3 hours of smoking your turkey, place the whole potatoes on the top rack above the turkey. Smoke them until they begin to ooze a little and feel soft. This will take anywhere from 2 to 3 hours. Serve these whole with butter, salt, and pepper as a savory dish. Or, mash them with a little butter, cream, maple syrup, and nutmeg for a sweeter side dish. Turkey is a lean source of protein. It is very low in fat. Turkey is an excellent source of B vitamins, potassium, and the minerals iron, zinc, and phosphorus. 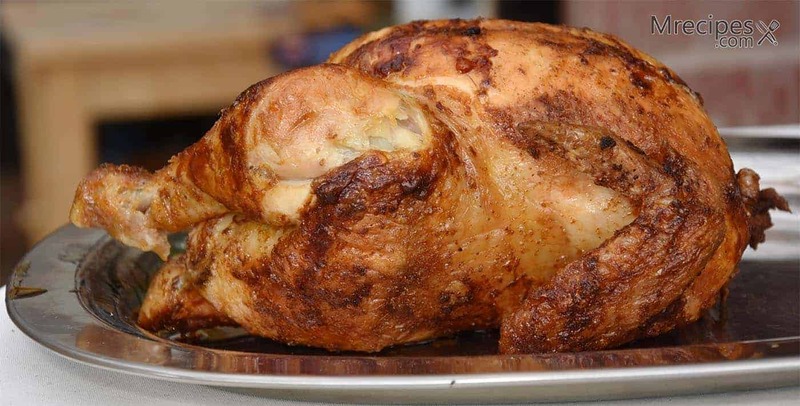 Turkey also contains L-tryptophan, an essential amino acid. Our bodies use L-tryptophan to make niacin, serotonin, and melatonin. Serotonin is necessary for mood regulation, and melatonin promotes restful sleep. Thank you, for this. this will be my first time smoking anything, so I will be using this recipe for my trial Smoker. Hello, Daren my name is also Daren. I have never seen anyone spell it the same way mine is spelled. Cool! Have a great thanksgiving and good luck with your bird! Well, the bird has been in the smoker for an hour now. Anxious to try it. Really easy instructions to follow and well written. Thanks for the recipe and Merry Christmas. Smoking my first turkey for the big game. Caking to garlic salt and pepper. Did you use ground thyme? I have done that before and knew I screwed up when I tasted whatever it was I made. I haven’t made this recipe yet, but, I would look there for the problem. Also, I don’t care for oregano in rubs like this so I leave it out. I’m going to smoke my turkey this Thanksgiving. We have a Masterbuilt smoker that we regularly use. My oven will be available to cook other dishes. This process will cut half of my time in the kitchen. Yes, as long as they will fit. You might switch their positions about halfway through. Also, having an instant read thermometer will allow you to check the bird that does not have the digital probe in it. yes… I am presently smoking 2-12 lb. turkeys right now… as long as you get them up to 165 degrees you will be ok.
We do a turkey, ham and turkey thighs in our masterbuilt gas smoker. I cut the turkey in half to make everything fit. 30mins for each lb. 20lb turkey would be 10 hours. Smoke an hour per pound at 225º. Hope it turns out well for you! I have an 18.5lbs monster I am starting tomorrow. I’m doing my 20.9 pound bird for 10-14 hours. I Brined. I’m hoping it’s not water logged. ( first timer- 10 hours 2 cups to 2 gallons- Dad’s recipe) Right now I’m about 139 in internal temp on the outside drumstick. Fingers crossed! Happy Thanksgiving! It took me 12 hours last year to smoke a whole 20lbs turkey. I just use butter brown sugar salt pepper. Best turkey I have ever had. Relating to your comments on brining–to me it is essential to brine a turkey prior to smoking or roasting. Just depends on whether you like your white meat more flavorful and moist as opposed to less flavorful and dry. Brining DOES make a huge difference. I’ve been brining my turkeys since long before brining was “cool”. I’m with David, I always brine (18 years at it). The salt helps to retain moisture, cook the bird more evenly and the added flavor is a plus. The white meat will be nicely moist, moreso than any turkey you ever had. I buy a fresh 20lb free range turkey with no added salt. Get a 5 gallon food grade bucket w/lid. You need to have about 2-1/2 gal of brine. I use a gallon of natural pressed apple juice, half gallon water, 4 light beers, 1-1/2 cup to 1-3/4 kosher salt, 1 cup brown sugar. Add hot sauce, Worcestershire, garlic powder and onion powder to liking. I start in the brine on Sunday night and remove Wednesday night in the mini fridge. Make sure you get a bird with no added salt. If you do have one, reduce to 1 cup salt and lightly rinse after brine. Tip. I use a bowl to hold the bird down, sandwiched between the lid and the bird. Also, might not want to brine the giblets, definitely not as long if you do. What is your suggestion for the vent? Wide open? Half way? 20 lb Turkey is too large to smoke. The internal temp of the breast will not reach 165 quick enough and you run the risk of having dangerous levels of bacteria. I never use any larger than 16 lbs. I also cook mine @ 200 f for 10 hours after injecting with seasoned butter and is always amazing. Be sure and coat outside with oil and season heavily. I have a 17lb Butterball that I want to cook at 260 degrees, approx how long will that take? How long would it take to smoke a 21 pound whole turkey in a master built 30 inch? Can you put stuffing in the turkey while it smokes? No. Do not put stuffing in a bird to be smoked. Seems easy! I was thinking about injecting it. Thoughts?? Hi Daren, I thank you for your tips on smoked turkey and sweet potatoes. I stuffed my turkey with celery, onions and apples after salting the cavities. I liked your idea of adding Apple Cider to Water. I will try that. As for the outside, I use butter and salt. Period. Simple. I am allergic to black pepper. My family loves my smoked turkey and we’ve done it since 1992! Thanks again! Next time I’ll try a different rub. But it was good. Had to crank up the temp of the smoker at the end because the rise of the internal temp slowed down to a crawl and we all wanted to eat. Used this recipe to smoke a 22lb whole bird. It worked perfectly. Insane how moist this bird is. I had to allow a little extra time because of a bigger bird. But thank you so much for sharing this with us all. I have a 11lbs turkey. It’s my first try at smoking it in my masterbuilt smoker. I read it’s a 6.5 hour cook. Should I cook longer? This is a great recipe, but it took my small 11lb bird about 10 hours to cook on my master built electric smoker. After about 7 hours, the turkey plateaued at 143 degrees (measured in the breast), and stayed there for about an hour. At around the 8 hour mark, I turned the heat up to 275. It turned out juicy and flavorful, but man… it took forever. Maybe it was the altitude here, maybe it was the cold weather (unlikely since the temp stayed steady), but those extra 4 hours of cooking cost my family Christmas turkey. The turkey didn’t finish until after our two youngest were in bed (luckily we had plenty of leftovers from our Christmas Eve party to feed them). It’s probably my fault, but I seriously didn’t think I’d need to put the bird in at 7am to be ready at 5pm for dinner. Oh, well. Merry Christmas, everyone! To all : max size should be a 12lb turkey for safety to cook all internal meat. Otherwise white gets dry . You can use two birds at 12 lbs each.